Thats the media for you. On a par with politicians. I think some of you are being a bit harsh; this is the first accident he's been involved in since 1997. Yep nail on head, any normal person. The Duke isn't a normal person and had two officers with him. Not wearing a belt is 3 points and up to a £500 fine. Despite the age thing, and the royal connection I know of people who are old and are not, who have written exemptions from the doctors from having to wear belts. My mother being a prime case. Her shoulder is screwed and she doesn't have to wear one. I do argue with her that it's better than going through the windscreen in bits but she won't listen. Many moons ago my colleagues commented on safety belt law and one came up with the idea of banning seat belts and having all cars fitted with a sharp 6 inch spike to appear from the steering wheel centre boss when the ignition was turned on. Same as people putting their feet on the dash in the passenger seats. Must be a right state when the air bag go's off and propels the knees through their foreheads. I read this idea in a Peter Hitchens column, the idea being that when we get into a 1 tonne protective cocoon of metal, the sense of protection and invulnerability this gives people often causes them to drive like twerps without regards for those around them. one thing that does appear to be overlooked is that his missus does own the highway. I read a piece about one of the occupants in the car and she has reason to be miffed but as we underling ours insurance companies tell us not to say or do anything in that situation. To their mind the Duke did wrong in going to see if they were injured and let's face it he was between a rock and a hard place with the media and some commentators. My old granny used to say, " Before you are critical of anybody, look hard in the mirror" and she was never wrong. i will hazard a guess now............that he will have another "incident"...the new vehicle he is in has already been bottomed out as the pics show a load of brash under the left hand side.........i rekon he will either end up in a ditch or a scrape with something......the man is just full of anger...which is a symton of something else..
i may be wrong but i dont think i am.. I must be deep in anger then Ditchie if you examine the underside of my Landie. I could probably turf a football pitch. 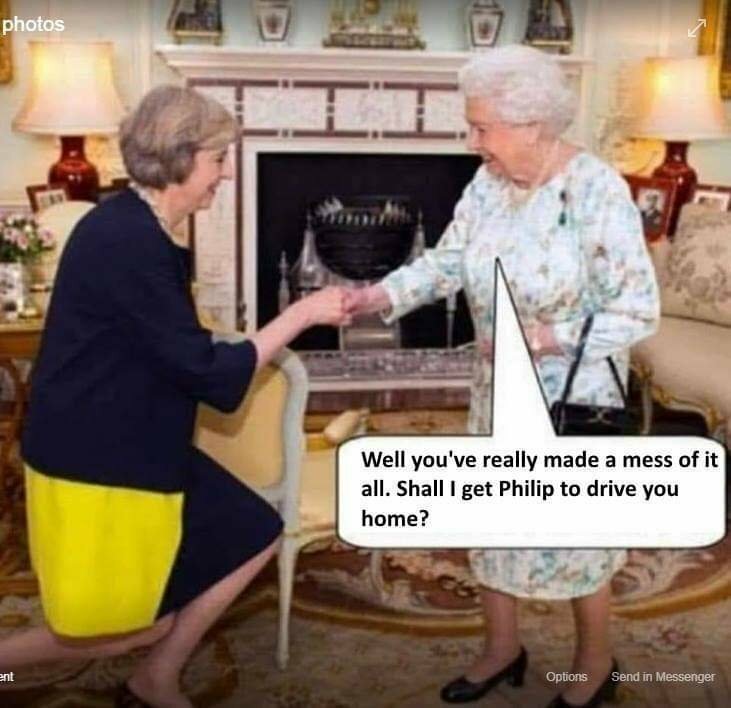 I see the Queen has sent a message of support to the one injured party who seems to want a lot of publicity and in my view not doing herself a lot of good. It's either a scam or someone is very generous, but I don't think I'd spend £65,000 on a few bits of dross no matter whose car they'd literally been ripped off and no matter which charity the dosh was going to. £0 to that sum in 139 bids on the 'bay. I am with Walker on this one, I think the Duke is right in avoiding the 'injured' party. The first rule of Insurance is "Admit NOTHING" and an apology is seen as an admission of guilt. The first thing he did, according to a witness that assisted in getting him out, was ask about the condition of the other parties involved. Judging by the press coverage of the so called 'injured party' and her TV appearances today, he probably did the right thing by avoiding direct contact. Perhaps the injured passenger has visions of milking this one for all it is worth ? At least their brains would remain undamaged !